Armed with our initial vision of a base garment that could essentially play videos or images on its surface, we’ve looked at some of the challenges that need to be addressed before this could become reality. Last time we looked at how a video playback garment might be actually work. Now let’s wrap this up by talking a little about how designers would go about actually designing images and video that would play on the garment’s surface. As we mentioned before, the human body is a solid 3-D object that we are trying to wrap a planar (flat) sheet around. This is no different from our fashion classes, where we are given a few yards of muslin and told to drape a mannequin (flat, almost 2-D textile sheet, 3D mannequin object). In moving from designing physical fashion to designing flat images to play on the video garment, we are doing much the same thing, except we are doing all of our draping on the image, not with the cloth. This requires a slight change in how we go about draping, since what we will actually be draping on is the base video garment, and what we will be draping with are 2-d images. And this is where the avatar comes in, since the process of draping a digital image onto a solid body requires a mannequin, in this case, an avatar. At its simplest level, an avatar is nothing more than a digital representation of a human body. We already know how to go about putting clothing onto human bodies, or at least we should have learned that at design school. Taking our knowledge about draping onto the human body a step further, we simply need to substitute our expertise with Adobe’s Photoshop and Illustrator rather than pins, needles and scissors to drape the avatar not with textile, but with imagery. Of course, like any new skill, it takes time and experience to get video garment images right, but a really nice aspect of designing for video garments is that the designer can create as many styles as she wishes, and she can ‘show off’ her design concepts using something like Black Dress Technology’s Virtual Runway™ service. Unlike draping with textiles, draping pixels on an avatar mannequin does not require the production of costly physical samples. You just design, upload it, watch the new style move on Virtual Runway, and then when the concept is approved, upload the design onto the base garment for approval. Once the design is approved, it can be made available for licensing on any of a number of web sites or even via mobile apps! Think about it – you can really share your fashion sense with your besties simply by sending them a link. Some designers may decide to open source their ‘basic’ video garment images and encourage their followers to customize their own designs. Of course, it will be an interesting question whether or not the maker of such a video garment will try to use a proprietary file format instead of standard ones like jpg or png files. Also, will the video garment be an open format, or closed format like the Kindle e-book reader? Amazon would no doubt love to get in the fashion game (everyone seems to want to be there, these days), and it would be entirely possible for them to come up with some version of a proprietary video garment, where they could sell the garment imagery just like they do e-books. We would anticipate that the early video garments wouldn’t have the data or battery capacity to actually play video, but as the base technology improved and progressed, it would not be out of the question at all to eventually truly have video garments that play moving images over the surface. Imagine the possibilities: a formal gown that plays back images of moving sunlight and shadow dapple over a forest floor, or waves crashing eternally downward to froth and foam (virtually) at the wearer’s feet. Think of the fun accessories designers could have developing product to complement such designs! Perhaps small scent pomanders contained in earrings or brooches, or tiny sound transistors with short loops of water waves or bird sound for a completely immersive experience, allowing the wearer to carry their own little environment with them. The possibilities are endless. All we need is for the materials sciences folks and the technology folks to catch up and give us the technology to do this. Then we fashionable folk can take it from there. Armed with our initial vision of a base garment that could essentially play videos or images on its surface, let’s explore some of the challenges that need to be addressed before this could become reality. Last time we looked at possible power sources for such a garment, including bettery textiles and other possible sources of power. This time, let’s look at how a video playback garment might be actually work. The human body is a 3-dimensional object, where we occupy a certain volume of space. The space we occupy is defined by Cartesian coordinates, X, Y, and Z. Cartesian coordinates begin at a ‘center point’, the precise placement of which is usually predetermined as a standard. For most body scanners, the X, Y, and Z axes are oriented so the scanned figure stands on the XY plane (the floor), and the Z axis extends vertically from the feet to the top of the head, so that X = the width of the body from side to side, Y = depth, from front to back, and Z = height from the ground to the top of the head. This is the sort of stuff that can make your brain explode but it’s also important, because in developing a video garment, the designer will need to be able to create a flat, 2-dimensional image (texture) which can be mapped to the X, Y, Z coordinates of the human body. That flat, 2-dimensional image is also called a U, V, W map, where U maps to X coordinates, V maps to Y coordinates, and W maps to Z coordinates. A designer needs to understand the ‘high points’ of the human body (e.g., the point of bust, shoulder, hip, and so on) so that as she develops a flat image to play on the video surface, she can begin adjusting the image in such a way to make sure the image wraps itself onto the video garment correctly, which will then, we hope wrap itself around the human body in such a way that it is both attractive, and yes, flattering. And this is where the fun of it all comes in because at this point, the designer can begin to really play with her art. Years of couture experience have taught us how to fool the eye with seam and trim placement; a good couturiere can make her client look 20 pounds lighter, and certainly feel like a princess. Imagine then, if you will, a couture designer being able to simply and easily create digital images that play on the video garments that allow their wearer to have access to the skills of the couturiere and to have their ‘off the rack’ digital designs easily adapted for their unique bodies. Nest time, we delve in further to the importance of the avatar in developing for a video garment. Last time we looked at some of the considerations for circuitry for such a garment, e.g., the links for power and for the actual data. This time, let’s look at how a video playback garment might be powered. Perhaps the largest challenge for any sort of wearable computing is providing the device with enough juice to make it work. Short of plugging it into the wall, how would a garment such as we propose be powered? We would have to say that at this point in the development of portable power supply, there is no good or easy solution. What we have seen coming up, may eventually provide enough power to enable such a garment, but at the moment, the technology is not yet well enough developed to make a video playback garment functional. The most obvious portable power source is a battery of some sort, but as any owner of a cell phone or lap top will tell you, the battery is disproportionately heavy in comparison to its size. Plugging in enough batteries to power a full garment would require a backpack worth of today’s batteries, and that’s just not very stylish. These textiles are very interesting, since it would seem that you could have a base textile that not only had the ability to play back imagery, but it could also generate its own power supply. Other things we have thought about for possible power supplies is converting the power of the garment wearer’s foot strike into an energy source. A woman wearing a high heel carries her full weight concentrated onto a tiny surface area. When walking, that force is concentrated by her momentum and other physical forces. It would be entirely possible to convert her entire high heel into a small power manufactory, but that power would need to be moved from the shoe heel to her garment. Perhaps seamed hosiery would become popular, as you could run an electrical line up the back of the hosiery in the seam, and connect the garment to the hosiery with a small conductive snap. And what a great project for the physicists, electronic engineers, and material scientists out there to work on! The issue of power supply is a big hurdle to get past, but luckily with the increased use of mobile devices, there’s increased focus in developing lighter weight, longer life-span battery supplies. Eventually this question will be answered in a way that enables wearable computing, or even wearable information storage devices, to become more fashionably useful. Next time: how to get it there, and why we should care about avatars in the wearable computing mix! Last time we talked some of the safety considerations of such a garment. This time, let’s discuss some additional safety considerations, namely the circuitry for such a garment. A ‘video garment’ such as we’re discussing is nothing more than a large play-back device. But in order for it to actually work, it needs to both receive data to actually play back on its surface, and it needs power to perform the playback. So the garment needs to be able to conduct two things in its circuitry: data, which must be uninterrupted, and power, which must be controllable for both on and off states, as well as possible rates of change. Any circuitry which is used for playback must be uninterrupted, and must not lose connection when the body moves and changes under it. As the garment follows the body contour and movements, the circuitry cannot be disrupted or the entire image will be disrupted, often in strange ways. What sort of materials might be used to ensure that dataflow remains persistent? There are currently a range of materials which are used to conduct power/data, including fiber optics, thin metal threads (usually copper), and of course, metallic, printable inks. Each of these materials has advantages and drawbacks: fiber optics are relatively inexpensive, being an ‘older technology’, and can be easily handled just like any other thread and woven into a garment. It is already used to carry optical data and lighting, and lovely textiles have been created using fiber optics. Some drawbacks to fiber optic textiles are that they are itchy for a wearer; if an optical thread is bent, it loses signal; and there is now easy way to connect up optical threads from different pieces of the garment (such a thread would need to be knitted into a one-piece tubular garment, which would change the addressing properties of the garment to playback imagery or video). Fiber optics are largely inert, so a wearer wouldn’t need to be concerned about the material having any dangerous chemicals being off gassed onto their skin. Safety considerations would be relatively minor other than the possibility of the fiber optics bending and breaking and perhaps scratching the wearer. Seams would need to be sealed carefully to prevent wearers from being hurt by the sharp cut ends of the optics. Thin metal threads have also been used to carry data and power. Very fine threads of copper metal are created, and simply woven into the textile just like any thread. Like the fiber optic thread, it too shares some of the same issues of not being able to readily connect the threads between two pieces of the garment, and while the copper thread would be softer and not prone to shattering, it might still be a scratchy experience for the wearer. Moreover, such a garment would need to be cleaned very carefully, as copper is reactive to many substances, and over time, it can oxidize, which reduces its effectiveness as a conductor. Lastly, it would need to be sealed in some way to prevent any voltage leaks or verdigris stains from the copper oxidizing. The third sort of circuitry would be the use of metallic inks. This is currently being used effectively in the toy and home furnishings industries, and can be easily printed onto a textile base. Unlike the woven in fiber optics or metallic threads, metallic inks can be printed on a garment after it has been largely constructed. This means that there is a complete circuit, without gaps at the seams which need to be connected. Moreover, the metallic inks can be overprinted by an impermeable, protective layer of polyvinyl chloride or polyurethane, which prevents seals the printed circuitry behind a protective layer that prevents leakage of voltage, data, or harmful chemicals from the ink itself. While this may sound great, there are still safety considerations, as printing metal-based ink often produces toxic fumes which need to be handled carefully. Metallic inks haven’t been in use long enough to know how they respond to laundering, and they have not been extensively used on a range of product classes, so it is unclear how they will wear or respond to cleaning considerations. It is possible, that with something like a flexible OLED for the base material, that the circuits could be designed to be embedded into the base material, which would remove many of the safety considerations and health hazards that a woven or printed circuit would have. Next time: powering up the garment. Last time we talked about comfort as it pertains to the make and manufacture of the actual garment. This time, let’s discuss safety considerations of such a garment. There are several areas of importance to consider with such a garment: first, of course, is the safety of the actual material used for the base garment; secondly is the safety of the circuitry; third is the safety of the power supply; and fourth is something which is often ignored by both apparel and accessories designers, the ergonomics of such a garment. The actual material used, by its nature, will be very new to the industry. Since it is unclear if it will something like a flexible glass, or something like a giant OLED, it’s difficult to assess the precise nature of safety concerns, but some things will always remain a concern: does the material off-gas at any point in its development or wear cycle? By this we mean are any sort of noxious fumes released by the material? We all know about the toxic side-effects of formaldehyde and other chemicals used in various ways in the apparel industry. We all also know how horrific a textile warehouse can smell from all of the other chemicals used in developing just the textiles alone (bleaches, aldehydes, and so on) most of which will give the user anything from a mild headache to an allergic response to, with enough exposure, various long-term health issues. Any new material used in this way should definitely address some of these considerations, and be as inert as possible. Materials in the ware house are bad enough, with the build-up of fumes and other gaseous effluent, but covering a wearer’s body, and being exposed to the wearer’s skin presents even larger challenges to keep the wearer safe. Beyond simple storage considerations, how would such a new material be handled, cut, constructed, packaged, and eventually, shown? What sort of health concerns might we need to have beyond the obvious ones of the material shattering easily: would this create splintering or particles which a worker would need special protective tools and garments to avoid being cut or injured? And what about the wearer? Would a garment made from a ew base material capable of playing back images or videos be shatter-resistant? How would the wearer be protected from possible health considerations, and how would such a material be developed to ensure the wearer’s safety? If it possible, even, to build safety features into the material, e.g., to provide it with micropore filtration devices, to filter out pollutants and harmful radiation like ultraviolet and other wavelengths? A garment that would enable an increased level of health and safety for the wearer would provide an exceptional boon to the wearer, who could be both stylish and safe at the same time. Next time, we’ll look at other safety considerations. Last time we talked about some of the properties needed by a material used for comfort. This time, let’s discuss comfort as it pertains to the make and manufacture of the actual garment. There are certain stress points in every garment that can cause discomfort to the wearer if the construction techniques used aren’t properly executed. For example, all internal seams should be properly finished with an appropriate thread in order to reduce chafing and itchiness in the wearer. Places where multiple seams meet need to be ‘graded’, or have the bulk reduced, so that they do not create a possible source of chafing. Seam placement should avoid being placed across areas of the body where they may rub or chafe. In the case of a base ‘video’ garment, seams should not only be placed carefully and finished to avoid chafing and discomfort, but they should also be sealed so that all circuitry is contained and not exposed to the wearer’s body. This will prevent minute electrical discharges along the seam edges ‘shocking’ the wearer. That of course, brings us to the question of the safety considerations of such a garment, next time. Armed with our initial vision of a base garment that could essentially play videos on its surface, let’s explore some of the challenges that need to be addressed before this could become reality. Last time we talked about some of the properties needed by a material used for a base garment. This time, let’s look at issues of comfort. Comfort can be a very subjective term, because different cultures have different expectations of ‘comfort’ in their garments based on their societal expectations of behavior, the climate in which they are based, and the materials which are readily available and part of their cultural meme. What a culture based in the equator might regard as comfortable would not be regarded as comfortable by a culture based near the Arctic Circle. And while this is of course an extreme example, it serves to highlight why comfort can be so challenging to define. Most garments are made of woven textiles. 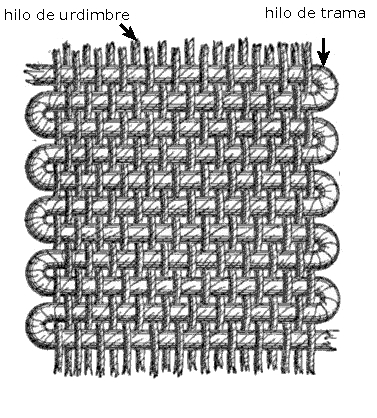 A woven textile is made of multiple threads, which cross each other at a 90 degree angle, and which are more or less tightly ‘packed’ together to form the weave. No matter how tight the weave may be, however, there are always small spaces or holes left between the crossing threads. Even threads that to the naked eye seem to compactly touch one another are not actually completely meshed together. These tiny holes allow air to enter the garment, and perspiration and heat to leave the garment. The degree to which the fibers of the threads interconnect, the size of the thread, and of course, the spacing of the threads in the weave will all have an impact not only on the comfort of a garment, but also on its durability. Even those materials which are not made of woven threads have small interstitial air holes or pockets, which enable garments made from these materials to ‘breathe’. This concept of breathing is critical for comfort: in both warm and cold climates, materials that don’t breathe lock perspiration inside the garment, which eventually leads to discomfort from overheating. In very cold climates, the inability of a textile to breathe, or vent water vapor, leads to clamminess and eventually to the wearer experiencing cold. Any material used for a base garment would need to have the ability to breathe, regardless of whether or not it was a woven or a nonwoven. The glass substrate might be able to have some sort of micropores (tiny holes for breathing) incorporated into it, which would help create a more comfortable material to be worn. This question of comfort also arises in the make and manufacture of the actual garment, which we will address next time.